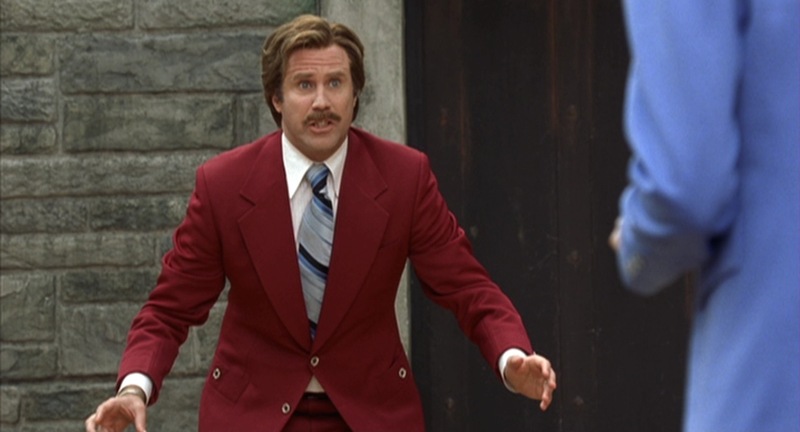 Ron Burgundy needs no introduction. Happy April Fool’s Day. 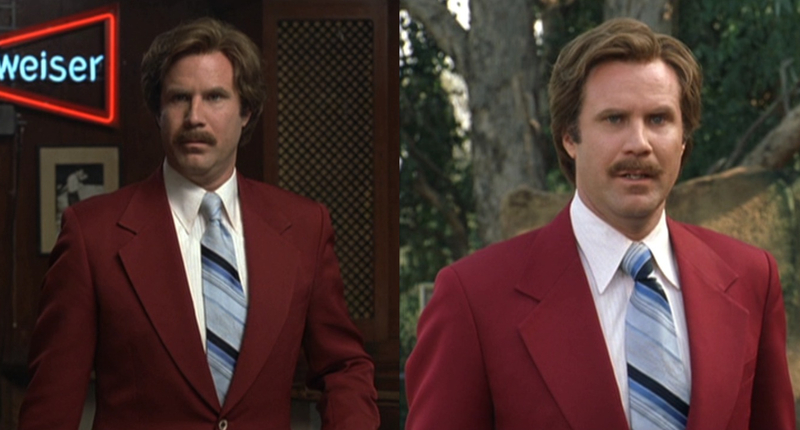 Although all of Ron’s suits are supposely so fine that he “makes Sinatra look like a hobo”, it is the red suit most associated with Ron Burgundy. The suit has become so iconic in the ten years since the film’s release that it is actually on display at the Newseum in Washington, D.C. through the end of August. 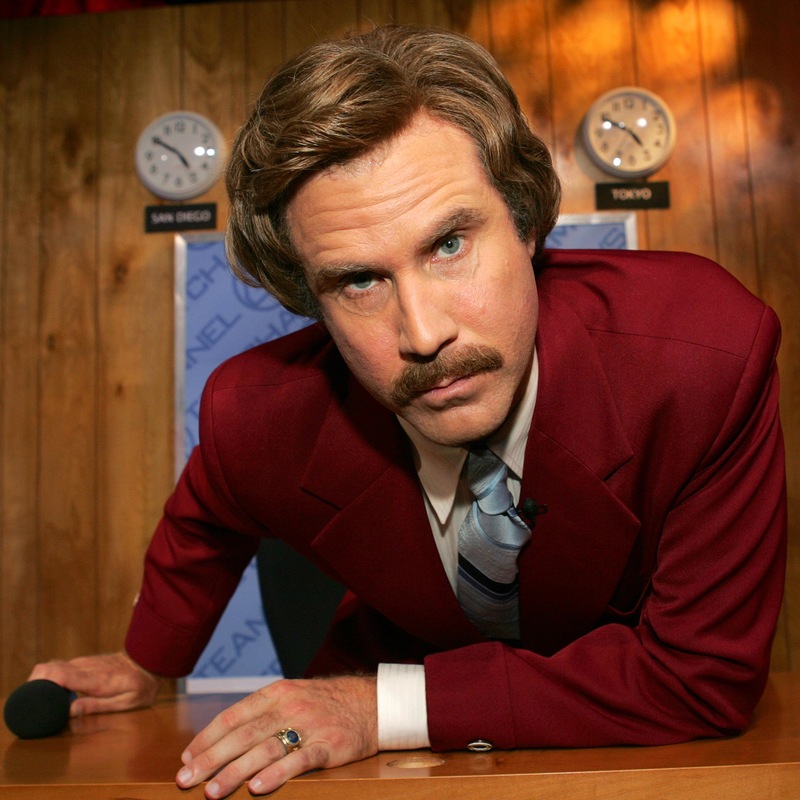 The Newseum suit is the exact one worn by Will Ferrell in the film; on display, it is matched with his first striped tie and white horsebit loafers. A quick comparison will tell you that the suit doesn’t even come close to making Sinatra look like a hobo, but brightly-colored and hideously styled clothing was all the rage in the ’70s. Matched with his casual sexism and bristling mustache, Ron’s suit would have marked him as a 1970s superstar all the way. The red suit is polyester, which was an insanely popular fabric for suits during the era despite the constant exposure to the open flames of the newsmen’s cigarette lighters. 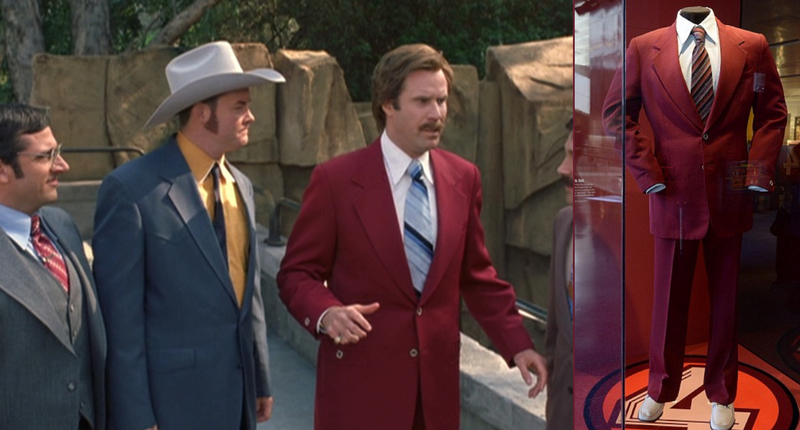 It looks like Ron has adopted a nearly identical three-piece version of the suit for Anchorman 2. 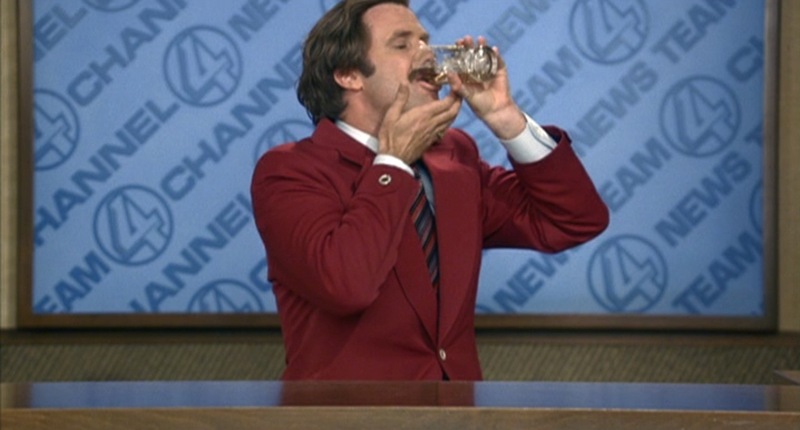 Ron’s suit jacket is single-breasted. Almost every detail of the jacket date it as the pinnacle of mid-’70s male fashion… which is not a good thing. The notch lapels border on comically wide, and the shoulders are padded. There is a long single rear vent. Ron finds himself immediately regretting a decision. The buttons are a faux-wood plastic, from the 2-button front to the 1-button tab cuffs to the button-through patch pockets on the hips. The welted breast pocket is buttonless, as most breast pockets are. It’s a button rarely found these days. The matching red polyester trousers have a flat front and belt loops for the leather belts that Ron typically matches with his shoes. The legs flare down to plain-hemmed bottoms with a medium break over the shoes. 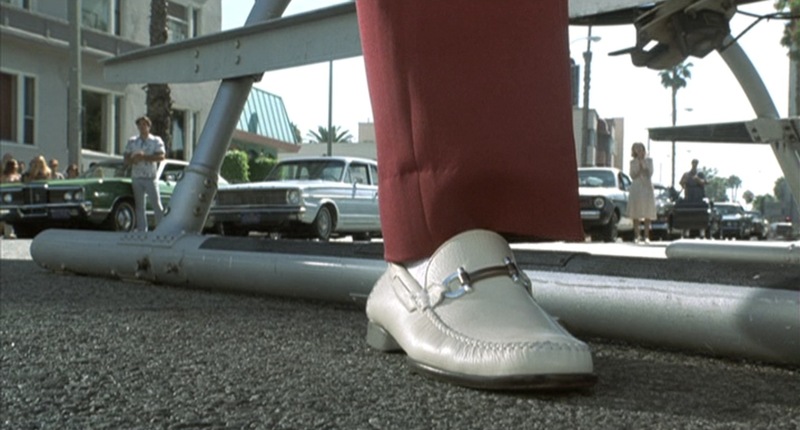 Ron makes his grand helicopter entrance at the start of the film wearing white horsebit stitched leather loafers with black rubber soles, paired with white dress socks. Gucci introduced the horsebit loafer in 1953 and immediately became recognizable as a luxury shoe for men. It’s hard not to look cool when stepping out of a helicopter. In films, it became the casual shoe of choice for Roger Moore’s James Bond and also showed up in a fair share of gangster movies, including on Henry Hill’s feet in Goodfellas. For the latter portion of the film, when he wears this suit exclusively, Ron wears dark brown leather split toe bluchers. Best seen when he is eating chicken in his bed after losing his dog, his girlfriend, and his job, he wears red silk socks to continue the legline from the trouser bottoms into the shoe. 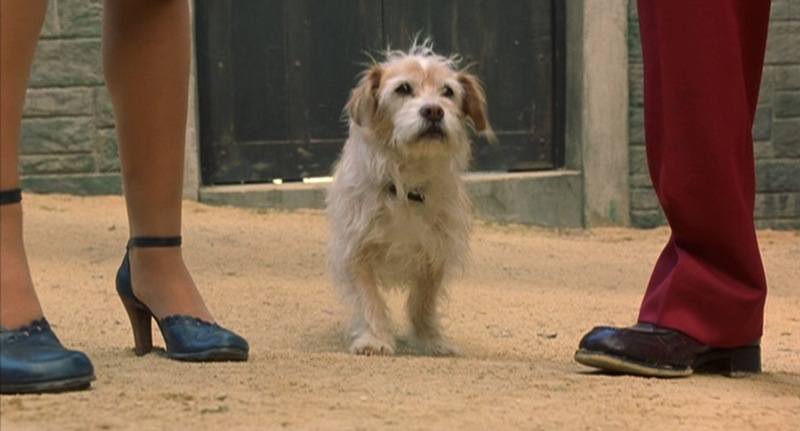 Since Ron always pairs his belts with his shoes, he wears a white belt during the opening scenes and a brown leather belt – with a brass clasp – for the finale. 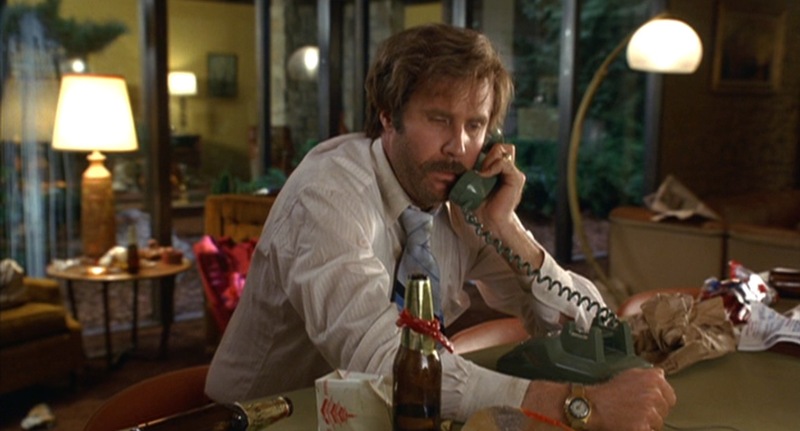 Ron’s shirt is a white-on-white tonal striped dress shirt with a very large ’70s-style point collar. Other details include a front placket, breast pocket, and rounded button cuffs. 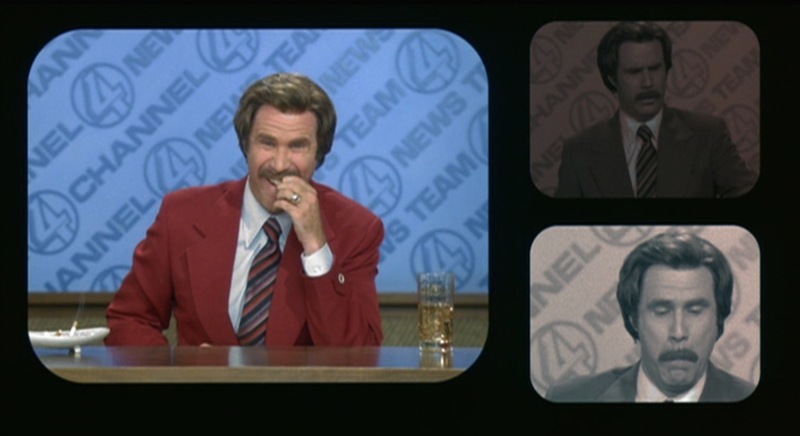 For the opening sequence, Ron wears a striped tie in various shades of red and blue. The stripes follow the British left-down-to-right direction. A very similar tie, albeit with stripes in opposite directions, can be found on Etsy. This is a good tie to wear if you had ribs for lunch. The second tie, which Ron spends much more time wearing, is an equally tacky light blue tie with blue stripes in varying widths and shades. The stripes run right-down-to-left with thin blue stripes and thicker stripes in the middle. Ron in various states of preparing for action. In the scene immediately after Ron unknowingly curses the entire city of San Diego, the tie is clearly fastened higher for some reason, with the thicker middle stripes appearing directly under the knot rather than at chest level as they do usually. Being a man of the ’70s, Ron wears plenty of gaudy gold accessories. On his right pinky is a gold ring with a flat surface. 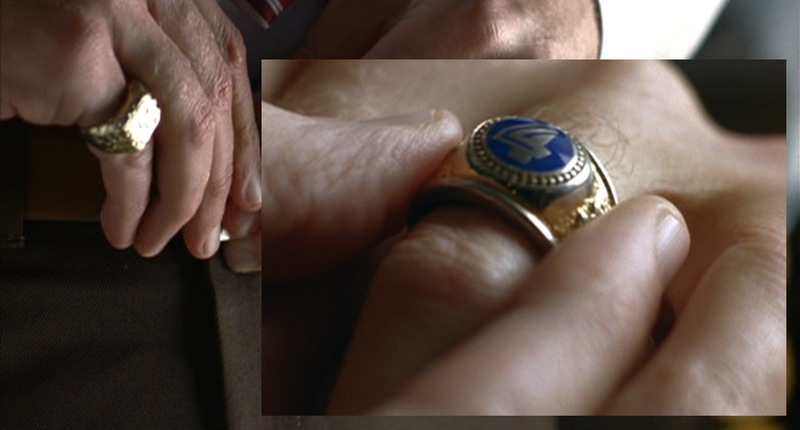 On his left hand, on the finger typically reserved for wedding rings, Ron wears a gold ring with the Channel 4 logo on the blue face, a symbol of his “marriage” to the Channel 4 news team. Ron’s watch is gold with a dark blue and white dial. Despite being a broken man, Ron still has his classy watch. 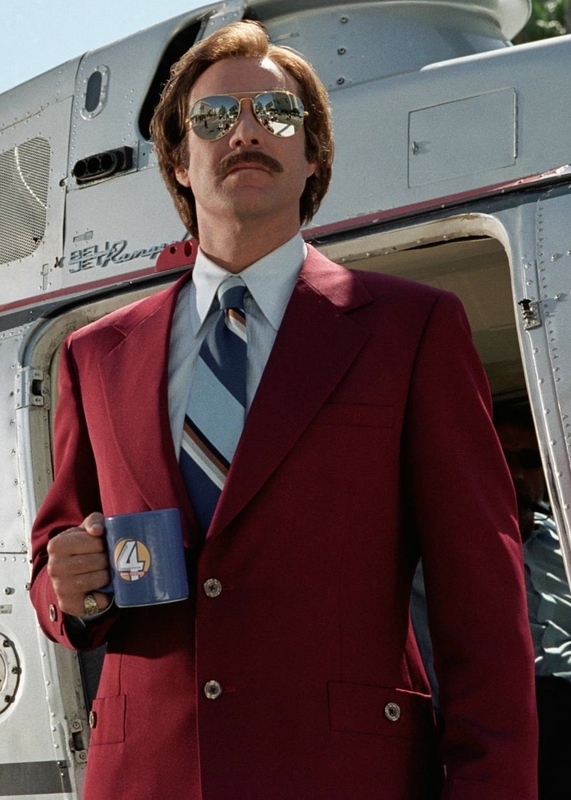 Although we only see them in production stills, Ron wears a pair of gold-framed aviators with reflective lenses when stepping off of the helicopter. No ’70s he-man would have been complete without such eyewear. Finally, Ron’s undershirt. 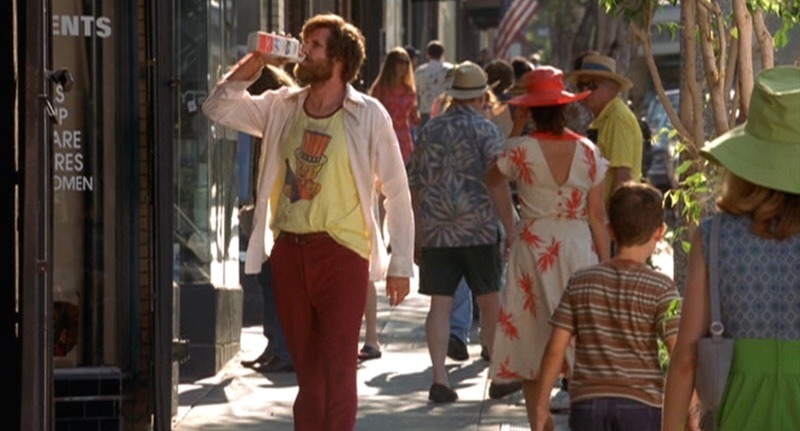 It’s likely that he didn’t wear this under his suit throughout the whole film, but we do get a peek at the pale yellow t-shirt Ron wears underneath his dress shirt when discovering that “milk was a bad choice”. The t-shirt has dark red piping and a strange cartoon graphic that appears to be a young blonde boy dressed as Uncle Sam while proudly carrying a blue bottle of wine. If this is some well-known character, please let me know. I’m genuinely baffled as to what this shirt might be and any search for “Ron Burgundy t-shirt” (or its ilk) just yields results with Ron’s face and some quote from the movie on them. This is the proper way to drink Scotch, of course. Ron has a preference for Glenlivet, but he drinks cans of Schlitz when he’s feeling down and out. 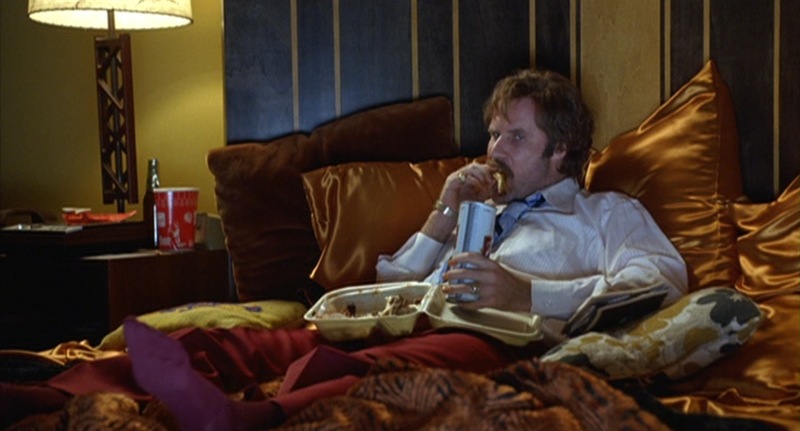 Ron kicks back with a tall boy of Schlitz and a broken heart. 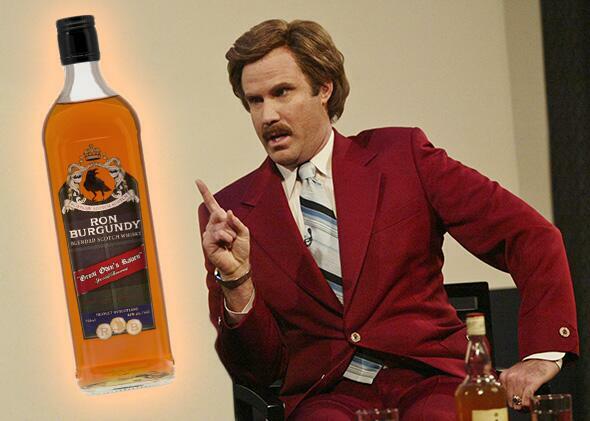 Ron rolls out a new blended Scotch that is sure to be a big hit. It should be noted that all buttons are the same tacky faux-wood plastic. Prominent attention is also given to a pair of white horsebit leather loafers, which would be equally appropriate. This might be the most quoted movie of the last 20 years. 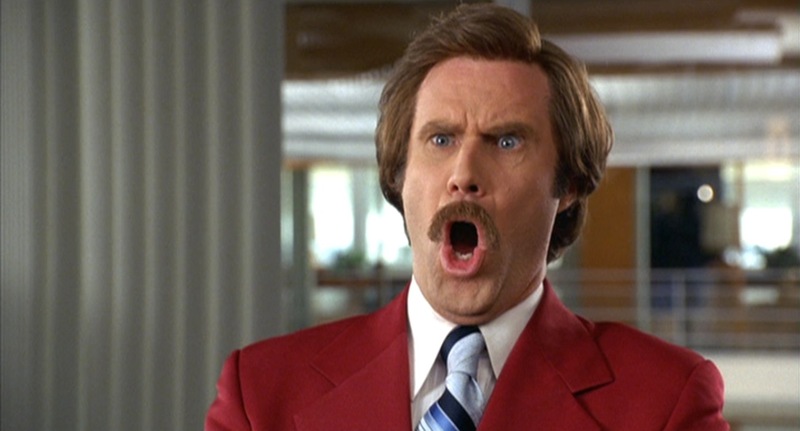 You know you have a friend who quotes Anchorman too much, but it’s still funny to hear the lines from the actors themselves.